The control of odorous gases and the corrosion of sewers are the two most important problems in operating wastewater collection systems. H2S is the most commonly known and prevalent odorous gas associated with domestic wastewater collection and treatment systems. InfoSewer. 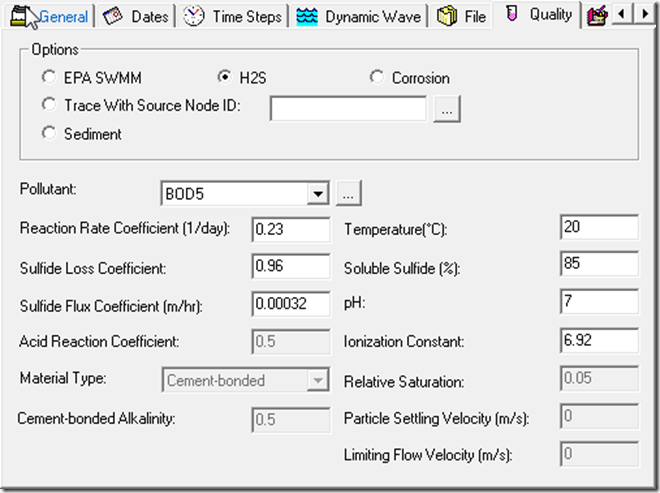 InfoSWMM, H2OMap SWMM or H2OMAP Sewer suite gives wastewater engineers a powerful Operations and Maintenance (O&M) tool to readily model and analyze entire sewer collection systems for sulfide generation and corrosion potential under varying conditions anticipated throughout the life of their systems. 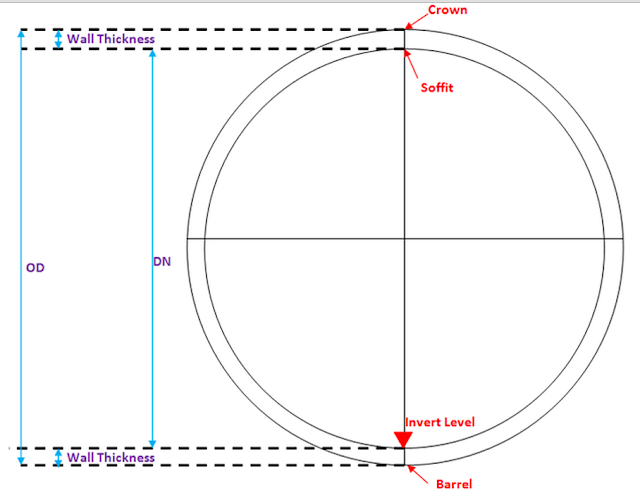 H2S predicts sulfide buildup in sewer collection systems for gravity sewers, force mains, and wet wells using the Pomeroy-Parkhurst equations. This unique and powerful tool enables wastewater utilities to pinpoint odor and corrosion problems, develop effective monitoring programs, alert plant operators and sewer maintenance workers to potential danger and the need to observe safety practices, and evaluate and implement effective control system such as aeration, chlorination, and mechanical cleaning. average daily temperature for the region (in degrees C). reaction rate coefficient (per day) which was described above in relation to BOD modeling. pH of the wastewater. 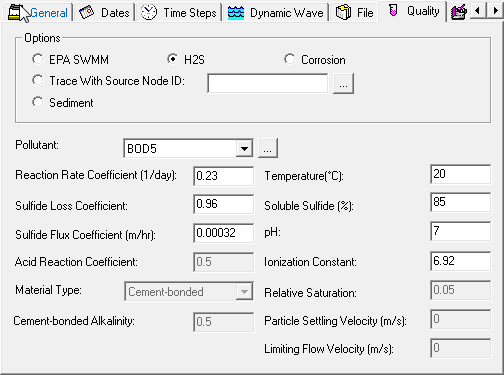 The normal pH range of municipal wastewater is 6.0 to 8.0.
effective sulfide flux coefficient for sulfide generation by the slime layer in gravity sewers (meter/hour). For conservative analysis (i.e., observed sulfide buildup generally less than predicted), the suggested values of this parameter is 0.00032.
a dimensionless coefficient to account for sulfide losses by oxidation and escape to atmosphere. For conservative analysis (i.e., observed sulfide buildup generally less than predicted), the suggested values of this parameter is 0.64. For moderately conservative analysis a value of 0.96 is suggested. logarithmic ionization constant for hydrogen sulfide (unit less), a function of temperature and specific electrical conductance of the waste water. Its value generally varies from 6.67 (at a temperature of 40oC and specific electrical conductance of 50, 000 micromhos/cm) to 7.74 (at a temperature of 10oC and specific electrical conductance of 0 micromhos/cm). percent of total sulfides that occur in the soluble (dissolved) form for the wastewater, most frequently known to vary from 70 to 90 percent. The default values used by the model for these inputs are shown in the following dialog box. In addition to the listed data, the user has to supply initial concentration of total sulfides and ultimate BOD of the wastewater. These two variables could be assigned using the quality tab available at the top of the attribute browser, for one source node at a time, or using the " Group Edit on Domain" feature that enables simultaneous assignment of the two variables for all source nodes in the domain. 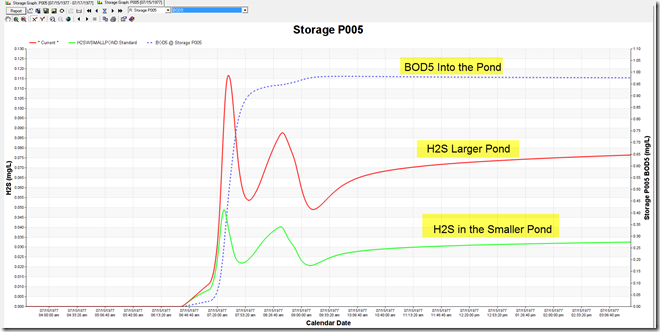 How the H2S concentration changes with an increase in Pond Area.